Do you remember the days back in high school when you just about peed your pants when called on to present a project? Oh, you still do that?! So does approximately everyone in the world who gets on stage and has to picture the audience in their underwear. We have great news for the every-day queasy, nervous being who gets in front of a crowd. We will help turn your presentations into those badass films that looked like no one was actually reading their lines…with teleprompters and teleprompter software! Also widely used in newscasting and pornos. DISCLAIMER: We do not ask exactly why a said person NEEDS our software, we just happily provide. We redesigned our MirrorScript teleprompter software from square one to improve it in every way. It scrolls incredibly smoothly, has many different speed options, and can handle longer scripts. You can customize the text of your speech to any easy-to-read size and colors you want. Not only is our software still free, but it’s actually better than most of the expensive programs on the market. Don’t waste your money, download our spyware-free teleprompter software today! If you like our software, please consider supporting our company by linking us on your website or purchasing one of our affordable Teleprompter products. We make it incredibly easy to get started delivering your speech with your teleprompter. All you have to do to get started is copy & paste your text right into the program window, or use it as a text editor to create your speech from scratch. You can do mirror image text with the software so that when it starts scrolling, the reflection in your beam splitter mirror reverses it back to normal text. 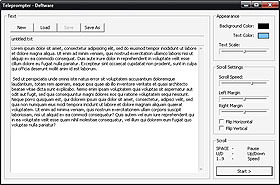 Best of all, unlike many of the other, expensive software packages out there, our free teleprompter software scrolls smoothly, without any sort of jerky motion. We offer four versions of our software, the latest being v4.0. The other versions are alternatives just in case you have any trouble getting v4.0 to work on your system. Your affordable source for zero learning curve – high quality PC teleprompter software. Expensive teleprompter hardware’s are not required either. Our Dual Monitor Prompter software is compatible with any teleprompter hardware reflector on the market. Load multiple scripts in the script queue with one key/click loading of previous or next script. Dual display with synchronized scrolling. 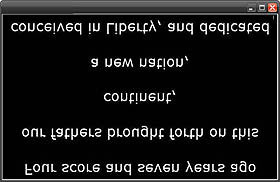 Mirrored text for reflected teleprompting. One handed controls – Can be operated with just the left hand. Mouse click the script to pause, reverse or shuttle script. Preset screen placements to the top or bottom of the screen for webcam or screen recording.